A VDR is not complete unless you can control it conveniently with your remote. yaVDR 0.5 supports a wide range of input devices, both infrared an radio remote controls. Your support is essential for the yaVDR project. In case your remote control is not working OOTB , please send your configuration files to the developers. This will give them the chance to further enhance the hardware support for upcoming yaVDR versions. By default, yaVDR 0.5 uses eventlircd, a system service that helps to harmonize the different drivers and input devices. It serves as a kind of filter, which gathers the key presses of all configured remote controls before it transmits them to the VDR. Eventlircd translated key presses of kernel input devices  into Lirc key presses. Basically, this is similar to the function of the remote plugin, with the exception that only these keys are assessed, where a keymap  is available. These input devices are e.g. regular keyboards or also remote controls, which are registered as a keyboard by their driver. Other remote controls that are attached to DVB adapters register themselves partially as keyboards, too. Finally, there is an new interface for remote controls which is called rc-core. Jarod Wilson  ported already most of the existing Lirc drivers as well as some drivers for remote controls connected to DVB adapters to this new interface. Although this interface is not a regular keyboard driver, it registers those devices as kernel input devices. Inputs from pointer devices (such as mice, touchpads, tablets) are also attached to the input interface. In these cases, eventlircd will forward them without further processing (unless the are remapped to a key event). Eventlircd recognizes input devices via an udev-attribute, even when a daemon attaches them after the start of the system. This is a one of the greatest advantages of this solution: eventlircd provides a lirc socket for the VDR when it starts, while the input devices are attached afterwards as soon they are recognized. Eventlircd recognizes the devices in its field of responsibility by attributes that can assigned to the devices during its initalization. This is done by udev rules. For some devices, this is already working in the standard configuration (devices managed by rc-core, devices that are used by yaVDR developers, or also community contributed configurations that were given to the yaVDR team). From the application point of view, the output of eventlircd looks as if it would come from one single input device. Since some devices can definetely recognized (e.g. USB devices), the proper configuration can be attached via udev rules. The configurations fo all these devices can be stored on your system at the same time because udev activates the configuration only for attached devices. A translation table can (depending on device and/or driver) be passed to eventlircd to customized the key layout (so called evmaps). You can instruct Lircd  via the switch  --uinput  to direct its key presses to an device underneath /dev/input/. Thus, lircd can be used together with other input devices. In theory, it is even possible to start multiple lircd instances for different input devices with different configuration at the same time. For USB lirc receivers, an udev rule in /lib/udev/rules.d/98-lircd.rules and the lircd_helper, an instance of the lirc daemon is started, and the drivers and lircd.conf files that specified in the udev rule are used. For these devices, no further configuration via the web interface is required. If there are any lirc receivers that do not work out of the box, the appropriate udev rules have to be created manually. Sadly, recent lirc version are suffering from a bug when forwarding key presses in combination with --uinput. This results in doubled key presses at the event device (Instead, the key presses at the real lircd socket are ok!). Thus, yaVDR 0.5 facilitates lircd2uinput, to forward key presses from lirc sockets to eventlircd. 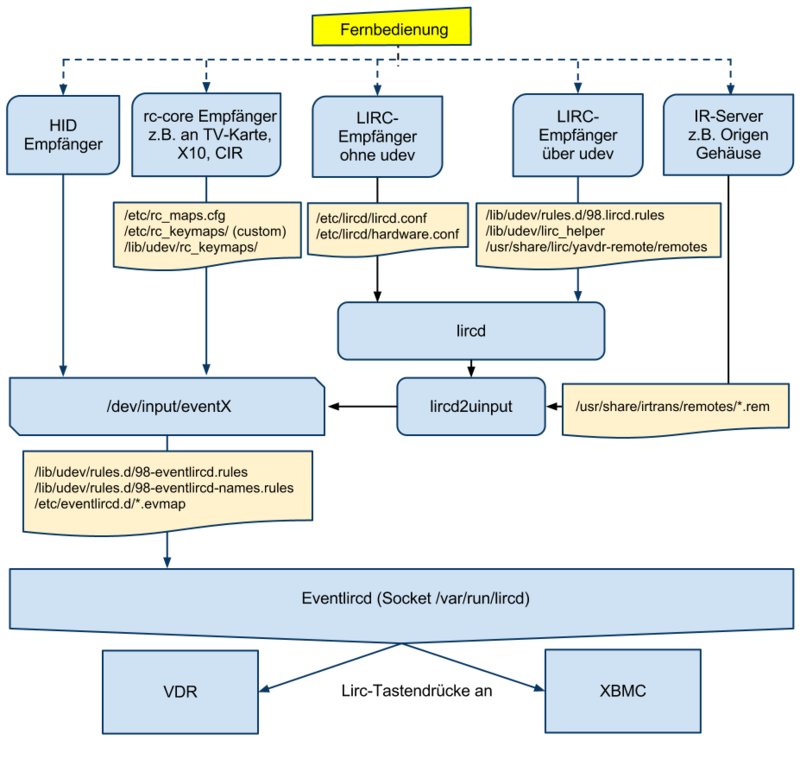 As shown in the graphics above, depending on the driver and the receiver device or DVB adapter, a keypress can be routed totally different paths until it is processed by eventlircd. This background information is important when eventlircd creates signals that do not match the standard key names specified in the remote.conf file of yaVDR. A manual configuration by the user is not required anymore if remote control and receiver are already known to the yaVDR developers and support was added. To take advantage of a eventlircd, a standard key assignment is required, that "normalizes" the keys from the different devices. In consequence, the "learning" function of the VDR is not used anymore. If your device is not supported yet, this may mean that you have a little more effort to manually adjust the keys until they match the assignment that the yaVDR developers specificed for lirc in the /var/lib/vdr/remote.conf file. Furthermore, lirc requires that the naming of all keys in the lircd.conf file follow the naming convention for input devices. We suggest to use the key names of our standard configuration. Caution when changing the remote contol in the remote.conf! yaVDR is optimized for a standardized remote.conf file for VDR and a matching Lircmap.xml for XBMC. This ensures that the remote control works properly in both VDR and XBMC. This requires, that the names of all buttons in the lirc configuration files, the key tables from ir-core and from devices that are directly attached to eventlird have to comply with the naming convention in the input.h header file of the kernel and fit to the remote.conf file. Otherwise, eventlircd cannot process the buttons properly. The customization of this mapping is decribed later in this chapter. The remote.conf is located in /var/lib/vdr/remote.conf and belongs to the templated files. You shouldn’t modify this file with exception of the configuration for keyboards or maybe special keys on your remote control. It specifies the names of the key presses that are delivered by the buttons of the remote controls. At the same time, the naming is harmonized with the XBMC configuration. Thus, XBMC can be controlled as well without additional customizations on its keymaps. evmaps should only be created for devices where no other option to tweak key names exists. For lirc and rc-core devices, it is preferred to create an appropriate configuration file (either lircd.conf or keymap) for the proper mapping of the buttons. All key presses that are passed to eventlircd can be modified by translation tables, the so called evmaps , before they are directed to the VDR. They are located underneath /etc/eventlircd.d/. They are either named by device name, driver or by product- and vendor ID from their udev rule. This lists all input devices that have a device node registered underneath /dev/input/. USB lirc receivers that are automatically configured, or for the lirc devices that were configured via the web frontend don’t have a dedicated entry. They can be recognized by the line N: Name="lircd". Power button at the case. directly attached remote contol (here: Hama MCE Remote with keyboard and mouse function). If you would like to monitor the keypresses of the input device, you need to stop eventlicrd and open the tool evtest with the paths /dev/input/event3 or /dev/input/event4. This input device is always present while eventlircd is running. It is a virtual input device that gathers all key presses of the connected and receivers and forwards themo the VDR. N: Name="i2c IR (Hauppauge WinTV PVR-350"
If there is a device with a sysfs path that starts with /devices/virtual/rc/rc, it can be configured using ir-keytables. ir-keytable provides information about the input device (/dev/input/eventX), the protocol in use and the used drivers for the IR input devices that use rc-core or the driver module ir-core. Furthermore, this program is responsible to load the key layouts that deviate from the standard in the rc-core drivers. The layout of receivers that are recognized as keyboards can only be changed via evmaps. For rc-core receivers, this does not make sense. Instead, it is recommended to create a customized keytable which will be loaded automatically via an rule in the /etc/rc_maps.cfg file during startup. If all keys provide an output with defined names, the script from here will help to create and load a customized keytable. Key names and their function can be adjusted to your individual needs while they are save from updates of the yaVDR keytables. It uses the ir-kbd-i2c driver, and ir-core loaded the key table rc-rc5-tv. The following command prints the mapping of scan codes and key names for a given receiver. This is especially useful when a keymap is loaded, while the naming of the buttons does not comply with the naming convention. With ir-keytable, you can determine key codes of the remote control, e.g. to verify whether or not key presses are recognized at all, or to create a keymap that fits to the file /vdr/lib/vdr/remote.conf from yaVDR. Since eventlircd captures key presses, you have to stop this service before. Also, it is recommended to stop the VDR upfront, to avoid unintented use of it. example output without loaded keytable. You can now create keymap that fits to your own remote control. Therefore, the hexadecimal scancode needs to to be assigned to a function of the key. scancode = 3d will become 0x003d, scancode = 01 becomes 0x0001 etc. Is is good practice to store the keymap with a self-explaining name underneath /etc/rc_keymaps/. There, it is save and will not be overwritten by yaVDR updates. The keytables that are provided by yaVDR are stored underneath /lib/udev/rc_keymaps/ and can be used as a template for your own customizations. Example for a custom keytable, which would be stored in /etc/rc_keymaps/pvr350 (extract). ir-keytable does not accept pure comment lines. If a head line is used that specifies the keytable name and the IR protocol, please make sure that you use valid values are used for both parameters. To support the automated loading of keytables, you have to create a rule for the remote control in /etc/rc_maps.cfg. Since this is one of the templated files, you have to create a custom template for your own entries to avoid overwriting by yaVDR update. The driver and the name of the keytable was determined via sudo ir-keytable as described above. For testing purposes, you may load or reset the settings for devices attached to ir-core manually. How is the rc_maps.cfg file evaluated? An udev rule in /lib/udev/rules.d/40-ir-keytable.rules is used that loads the keymaps according to the rules in the /etc/rc_maps.cfg fil (ir-keytable -a /etc/rc_maps.cfg). loading a keymap manually using ir-keytable. -w <keymap> specifies that keymap that will be loaded. Further information can be found in the manpage of ir-keytable. example output of ir-keytable -t for the same keys with appropriate keytable. evtest is a tool that allows to gather detailed information about a device that is registered as a kernel input device (under /dev/input/event<X>). It can be installed via the package evtest if not done already. To see the output of key presses, eventlircd needs to be stopped before. Input device name: "i2c IR (Hauppauge WinTV PVR-350"
udev is a service that allows to recognize and register hardware dynamically. Each device is usually equipped with unique identification characteristics by the vendor. Thus, udev rules can specify which drivers, modules or commands shall be activated when the device is recognized. Rules in the file /lib/udev/rules.d/98-eventlircd.rules can specify which configurations are loaded by eventlircd for USB remote controls. Example for an entry in /lib/udev/rules.d/98-eventlircd.rules. Loads the evmap for the device. In this example, the environment variables will be replaced, which results in the name "03_0419_0001.evmap". Accordingly, the file /etc/eventlircd.d/03_0419_0001.evmap will be loaded. Sometimes, it may not be possible to reliably determine the receiver exactly by vendor ID and model ID. (e.g. X10 receivers). Thus, further udev attributes will be evaluate. The special udev rules for these receivers are located in /lib/udev/rules.d/98-eventlircd-names.conf. The command sudo irw shows the keys that are sent to the VDR When eventlircd is started. The output of the recognized keys can be cancelled via Ctrl + c. irw can also listen to lircd sockets, when the path to the socket is specified. irw with a Hama MCE Remote while eventlircd is running. irw for lircd for the example of an Atric receiver  with a Hauppauge A415-HPG-WE remote control. lircd2uinput is a brigde that directs the key presses of a lirc socket to a virtual HID device. This device can then be attached to (and used by) eventlircd via an udev rule. In yaVDR 0.5, this is used for all lirc receivers and irserver. Also, futher services that provide key presses to a lirc socket can be connected to eventlircd using lircd2uinput. Some casings from Origen attach their remote to the IR server. The configuration files for these remote controls are located in the directory /usr/share/irtrans/remote/. The key names have to comply to the naming convention, or they will not work in yaVDR 0.5. The IR server provides a lirc socket. The received key presses will be forwarded to eventlircd with the help of lircd2uinput. yaVDR 0.5 does also support lirc receivers. If they can be properly identified, they will either be configured via an udev rule  or via the web frontend. Lirc receivers that are configured via the web frontend usually have to be configured by hand in the /etc/lirc/lircd.conf. The defintions for the remote key buttons need to be added there. This can be done via the web frontend ("edit configuration files") or per SSH or a local terminal. It is hardly possible to configure serial receivers like e.g. the Atric receiver or homebrew receivers automatically because they can be used with many remote controls. Nevertheless, it is easy to set them up for yaVDR with lirc. Settings in the web frontend. Check the box "lirc support" in the section remote control of the yaVDR web frontend and select the appropriate receiver in the list. For the Atric wakeup board, the proper entry is "Home-brew (16x50 UART compatible serial port)". Furthermore, you need to specify th serial port where the board is attached. The numbering is usually aligned with the specification in the user manual of your mainboard. Customization of the lircd.conf file. Now, the correct lircd.conf file has to be copied to /etc/lirc/lircd.conf. The key names have to comply with the naming convention that is defined in th input.h kernel header and should be aligned with the remote.conf, if you like to use them with VDR and XBMC. This will make sure that the remote control can be used with VDR and XBMC without further configuration. yaVDR 0.3 or the "old" lircd.conf. yaVDR 0.5 or the "new" lircd.conf. After a restart of eventlircd, the remote controls connected to the serial receivers can be used. The key presses from lircd can be monitored by irw reading from /var/run/lirc/lircd.<PID>. For the Igor USB receivers, you only need to copy an appropriate lircd.conf to /etc/lirc/. An udev rule will automatically start and lircd process, and its output will be evaluated by eventlircd. The socket of lircd is usually at /var/run/lirc/lircd-lirc0 and be monitored by irw. Remote control settings in the web frontend! Do not activate lirc in the web frontend when using Igor USB receivers. Otherwise, two separate lircd processes will be startet which will block themselfs with the consequence that the remote control is not running! The yaUsbIr receiver ] combines an IR receiver and an wakeup device that is connected to the USB port. Thus, it is an interesting alternative to Atric receivers that are currently only available for the serial port. Maybe due to a bug in libusb (there are false "remove" events in Ubuntu), the yaUsbIR cannot be configured via udev rules. So it has to be activated manually in the yaVDR web frontend. The new kernel version 3.2.x in yaVDR 0.5 registers X10 receivers via the rc-core system. The drivers that are shipped with the kernel will not recognize the devices as keyboard-like devices anymore. Instead, a new driver module (which is also called ati_remote) will register them as rc-core devices. Accordingly, the customization of the key names should be done via your own keytables. Right now, the default kernel module ati_remote, that used in yaVDR 0.5, doesn’t support the scroll wheel of some X10 remote controls. An updated version is available in our linux-media-dkms package. In general, yaVDR supports bluetooth devices that are recognized as input devices. You need to decide whether the device is only used as a keyboard / mouse, or as a remote control for VDR and XBMC. The second option requires writing some udev rules to bind the devices to eventlircd. Each Bluetooth device that shall communicate with yaVDR needs to authenticate itself first. To avoid dependencies to adimistration tools with a user interface, we suggest the tools from the package bluez-utils. This package may need to be installed separately. Display all Bluetooth adapters - provides the hci<X> device. Lookup of devices (those have to be visible; for the PS3 Remote BD you have to press "Start" + "Enter" simultanously). Here, you can pick the desired device and note down the value of "Address". The PS3 Remote BD is directly usable after the initial pairing. Its keys are configured via the /etc/eventlircd.d/ps3remote.evmap.